Original Woodstock memorabilia is some of the rarest and most coveted music collectibles. 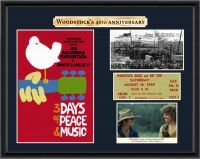 Items such as an original Woodstock poster, ticket, and program sell for hefty sums where these rare collector’s items are sparsely available. Everything Woodstock has a piece of history and novelty that comes along with it and collectors recognize the importance of the it place as the grandaddy of all music festivals. The Woodstock poster which is regarded as the most famous poster of all time has been authorized a rare second printing and still demands a price relative to the event’s historical importance. Woodstock memorabilia is more than just memorabilia. These pieces are the fabric of history. 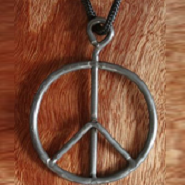 With the Woodstock 40th anniversary here at last, memories of the historic music event have mystically reappeared and many old timers would love to leave a defining object behind for their successors to cherish in remembrance. 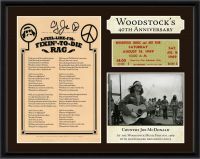 Some Woodstock 1969 memorabilia such as the posters and plaques are timeless pieces that will be appreciated for hundreds of generations to come (hopefully). 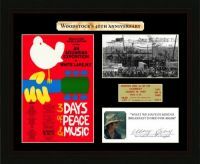 We at Woodstock Story wonder exactly how many people out there would like to shake the hand of the Woodstock poster creator Arnold Skolnick, who designed one of the best pieces of Woodstock memorabilia, the infamous cat bird dove sitting upon the guitar. By the way, in the original version, the bird was sitting on a flute. Those who own pieces of Woodstock memorabilia know the magic they bring to the surroundings and the spirit they continue to kindle.